An at-a-glance list of employees is always available. This grid can be set to show any or all of the following information: You can upload a file of employees with these details at any time. 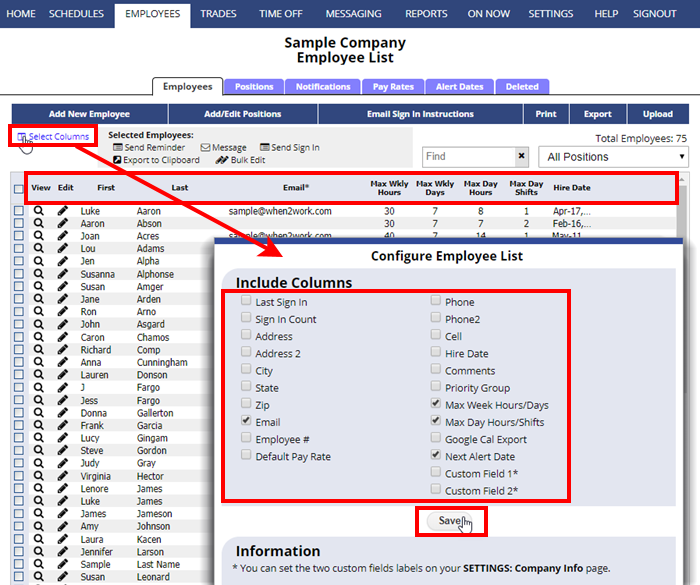 The Employee List displays as a grid and you can use the “Select Columns” link in the upper left to set which information to include in the grid. Click any column title to sort the list by that column. The grid can be edited right on the page or you can click the pencil icon next to an employee name to edit their information. You can check off the boxes for certain employees (or use the checkbox at the top to select all) and then use the links at the top of page to Bulk Edit them, Send those employees a message or include them if scheduled with a Schedule Reminder email or you can export the selected to the clipboard to be pasted and used in other programs.